Providing safe means of escape, or safe refuge, for the occupants in the event of a fire. Designing the building to limit the progress and spread of fire and smoke, and to minimize structural damage. Smoke is by far the greatest direct cause of casualties and injuries during fires—approximately 75 percent of fire vic- tims die from smoke inhalation (Gann, et al, 1994). These deaths can occur in areas remote from the fire itself due to smoke propagation throughout the building, which thereby contaminates other floors and rooms, as well as potential escape routes, such as stairwells and hallways. Could High Insurance Risk Premiums caused by Fire and Collapse at Oregon State University project trouble for the CLT industry and slow its ability to take market share as a renewable sustainable solution to meet the demands for affordable housing? Engineered Wood CLT is a prefabricated, engineered wood product made of at least three orthogonal layers of graded sawn lumber or structural composite lumber that are laminated by gluing with structural adhesives. The product has been in use in Europe for about 25 years. CLT has been used in the U.S. for about eight years. Based on recent fire test results, mass timber groups have adjusted product certification standards to require the use of cross-laminated timber with structural adhesives tested to demonstrate better fire performance. 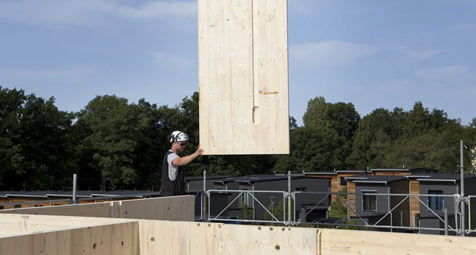 Consider why we spray pyro-create fire protect on steel structures when steel would pass an E119 test and you may begin to understand why we should more fire protection to all mass timber CLT building that only have E119 Class B raw lumber unless they plan on drywalling over all the wood.